(15Apr05) This issue will start the panel expansions on Bobsboat. The 1May issue will rerun the bulkhead bevel essay. 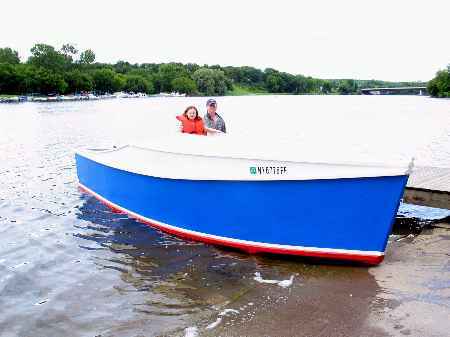 THE 16TH MIDWEST HOMEBUILT BOAT MESSABOUT will take place at Rend Lake in Southern Illinois on the weekend of June 11 and 12. Remember that lots of folks come on Friday and leave early Sunday. Take I-57 to exit 77W and then follow the signs to the Gun Creek Recreation Area. Camping at this Corps of Engineers facility is $10/night and that includes the ramp fee. There is no schedule of events except a pot luck dinner in the campground on Saturday evening - we wing it. This year some of us have reserved the campsites on the water of the two middle camping loops so look for us there if we aren't at the boat ramp. 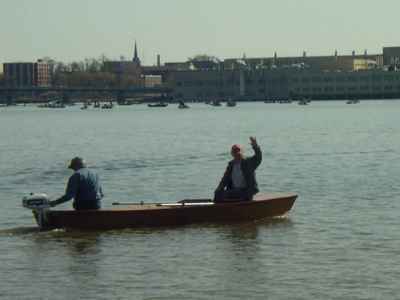 Jim Hauer & co. try out the new River Runner in Green Bay. 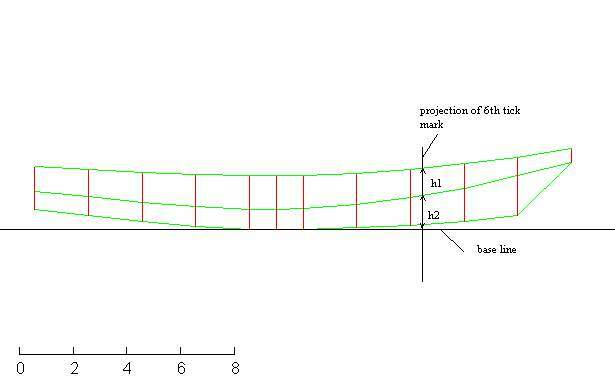 ... the lines had been laid down and we had made a Hullform model of it to scope it out in terms of capacity and looks. 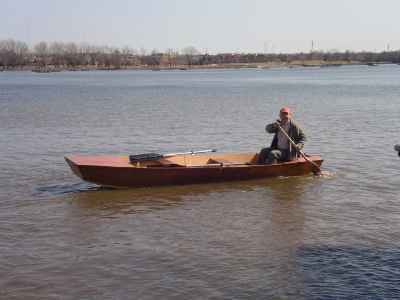 Once satisfied with the lines it is time on a boat like this to start the nitty gritty design of the bits and pieces. 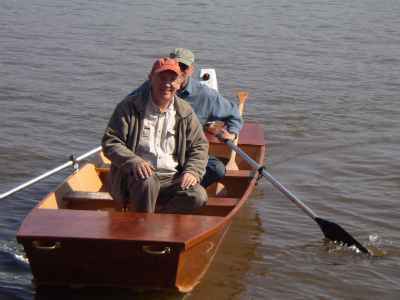 If this were a sailing boat I would go another step and do a preliminary sail rig design right now because the sail rig will determine the location of some major hull structure, something that doesn't affect the power only Bobsboat. 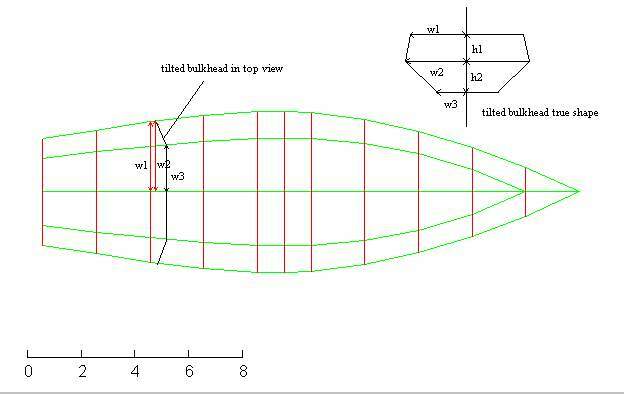 How to determine the shape of the bulkheads? We will start with a real easy one, say the bulkhead at the front of the cockpit at station 5. Pretty simple. 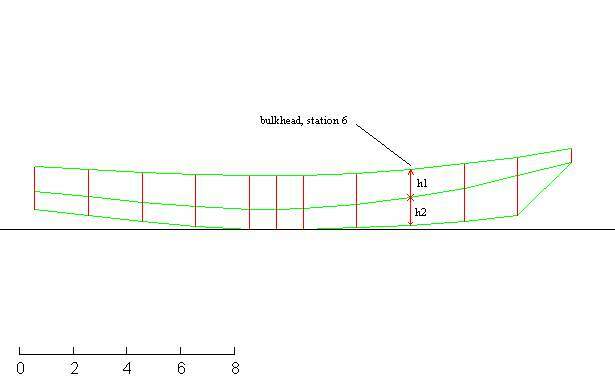 If you look at the side view at station 6 you can measure off the length between the bottom and the chine, and then the length between the chine and the sheer. 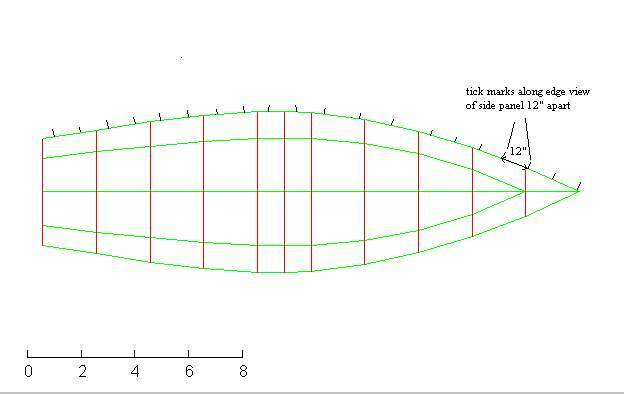 Note that your tick marks won't lie on top of the regular stations, the more the sides curve the farther the ticks will vary from the station marks as you tick from bow to stern. 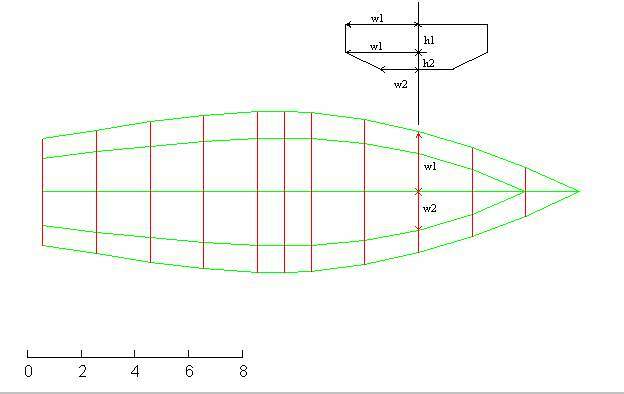 On a typical 15' hull you might expect the 15th tick mark to be 3" or 6" short of station 15. Do the bottom in the same way. 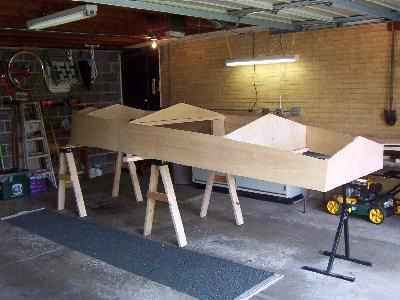 Scale the pieces on real plywood, cut them all out, and stick them together and you will have the beginnings of your real boat. 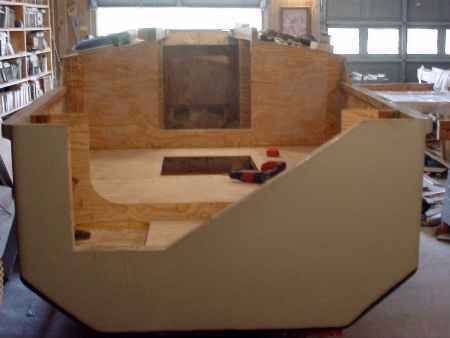 You will have a big hole where the chine panels fit but you will be able to lay a piece of plywood over that hole and scribe the panel to shape, cut it out and fit it in. That is how I drew the original Toto plans and on some of my earlier multichine plans like Mixer and Woobo I don't give the bilge panel shape but simply ask you to cut the panel to fit the assembly. 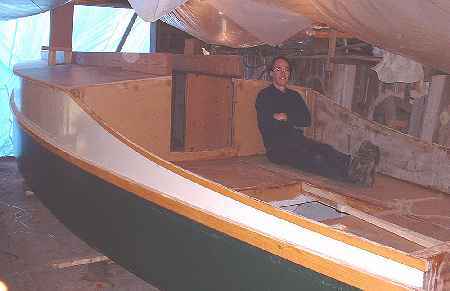 Got me off the hook back then and to tell you the truth you should always trial fit the bilge panels before cutting to the line since they are always the last piece of the hull puzzle to go into position and will collect all the errors, both mine and yours, of the total assembly. 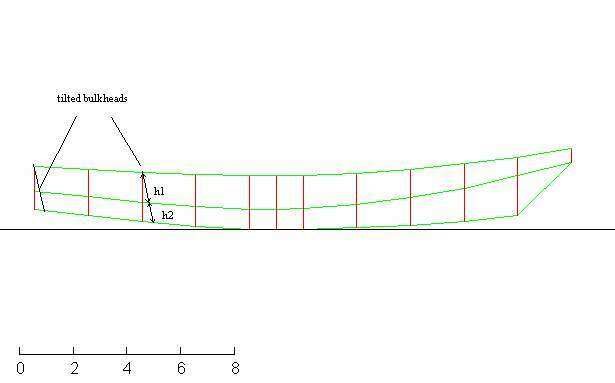 If the bilge panels are not twisted then you can do the same procedure as above to predetermine their shape. 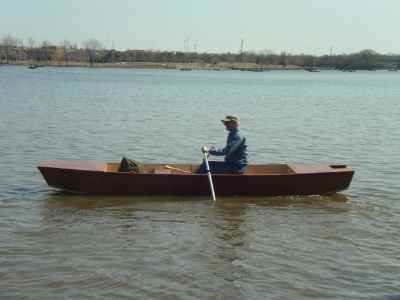 You will need to draw a new view of the boat so you can look at that panel on edge. 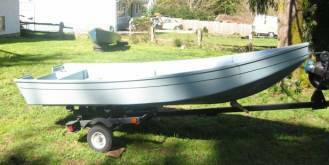 You will have to do the same if you have drawn a boat with flared sides. 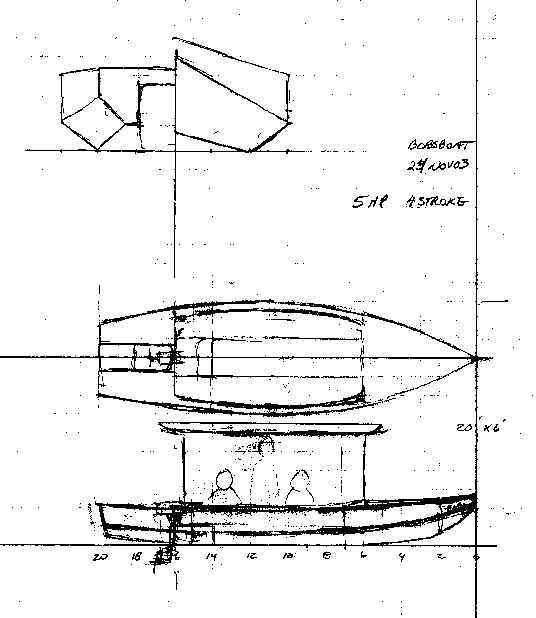 What is done today is to lay out the hull in a digital manner and we will pick this up in the next Bobsboat issue. The technique is so powerful that there is really no need to unwrap even simple side and bottom panels with the above method. Your PC, given the proper spreadsheet, can do it faster and with much greater accuracy. We'll rerun the bulkhead bevel essay. Garth has the big Cormorant project to the point where he can run power to it and set it up with a mattress and TV set and Mr Coffee and make it a hangout for the New York winter! 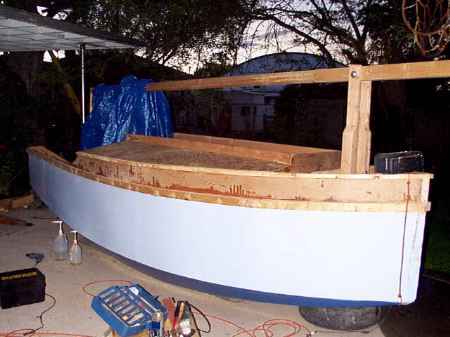 This long and lean project is a 19' version of Toon2. I don't have the drawings done yet. The builder is working from preliminary drawings and is about to pass me up. MDO plywood looks like cardboard now but it isn't.